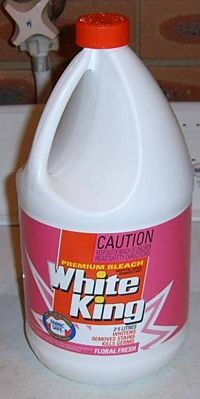 A bleach is a chemical that can remove or lighten the color of an object, often by a process known as oxidation. Common chemical bleaches include chlorine bleach (sodium hypochlorite) and oxygen bleach (peroxide-producing chemicals). Household bleach (chlorine bleach) is used in the home for whitening clothes, removing stains, and disinfecting. Peroxide-producing chemicals are common bleaching additives in detergents and toothpastes. Some organic peroxides are used to bleach flour. In addition, chlorine dioxide is used to bleach wood pulp, cellulose, textiles, and fats and oils. Bleaching is often a preliminary step in the process of dyeing. Chlorine was first characterized by the Swedish chemist Carl Wilhelm Scheele in 1774. Based on the phlogiston theory that was widely accepted at the time, he called it "dephlogisticated marine acid." French chemist Claude Louis Berthollet, noting the bleaching properties of chlorine, invented hypochlorite bleach in 1789. In French, bleach is known as Eau de Javel, after the village where it was manufactured. Household bleach, also known as chlorine bleach, has the chemical name sodium hypochlorite, with the formula NaClO (or NaOCl). It has a pH of 11 and is used in the home for whitening clothes, removing stains, and disinfecting. In this process, sodium hypochlorite yields chlorine radicals, which are oxidizing agents that readily react with many substances. Chlorine bleach is often used with laundry detergents and is also a common disinfectant. Using chlorine bleach on garments made of wool, nylon, silk, leather or any amount of spandex will stain the garment yellow which is permanent or very difficult to remove. Another agent with similar action is bleaching powder. It consists of a mixture of calcium chloride (CaCl2), calcium hypochlorite (Ca(OCl)2), and calcium chloride hypochlorite (CaCl(OCl)). Oxygen bleach contains hydrogen peroxide or a peroxide-releasing compound. A common example is hair bleach, which contains hydrogen peroxide (H2O2). As hydrogen peroxide decomposes, it gives off oxygen radicals. Oxygen and chlorine radicals both have comparable bleaching effects. Various other peroxide-yielding chemicals are commonly used as bleaching additives in detergents, toothpastes, and other products. Examples are sodium perborate, sodium percarbonate, sodium persulfate, sodium perphosphate, sodium persilicate, and their ammonium, potassium, and lithium analogs. In addition, calcium peroxide, zinc peroxide, sodium peroxide, or carbamide peroxide may be used. Chlorine dioxide is used for the bleaching of wood pulp, fats and oils, cellulose, flour, textiles, beeswax, and in a number of other industries. In the food industry, some organic peroxides (such as benzoyl peroxide) and other agents (such as bromates) are used as flour bleaching and maturing agents. Not all bleaches are oxidizing agents. For example, sodium dithionite is used as a powerful reducing agent in some bleaching formulas. An oxidizing bleach breaks up the chemical bonds that make up the chromophore. This changes the molecule into a different substance that either (a) does not contain a chromophore, or (b) contains a chromophore that does not absorb visible light. A reducing bleach works by converting double bonds in the chromophore into single bonds. This eliminates the ability of the chromophore to absorb visible light. Sunlight acts as a bleach through a process that may have similar effects on the chromophore. High-energy photons of light, often in the violet or ultraviolet range, can disrupt the bonds in the chromophore, rendering the resultant substance colorless. A problem with chlorine is that it reacts with organic material to form trihalomethanes like chloroform, which is a well-known carcinogen. There is an ongoing debate over whether any risk from the chloroform in treated drinking water is worth the benefits. Yet, the use of elemental chlorine in industrial processes such as paper bleaching, with its attendant production of organic pollutants (such as dioxins), does not have any benefits. Consequently, over 80 percent of woodpulp is bleached with chlorine dioxide, reducing the generation dioxin below detectable levels. Chlorine is a respiratory irritant. It also attacks mucous membranes and burns the skin. As little as 3.5 parts per million (ppm) can be detected as an odor, and 1,000 ppm is likely to be fatal after a few deep breaths. Exposure to chlorine should not exceed 0.5 ppm (for an eight-hour time-weighted average, during a 40-hour week). Chlorine bleach should not be mixed with cleaners containing ammonia or used to clean up urine. Such mixtures produce toxic chloramine fumes and an explosive called nitrogen trichloride. For these reasons, some consumers prefer the use of natural cleaning products as an alternative to chemical cleaners. ↑ Cleaning Up: Yellow Bleach Stain, AllExperts.com. Retrieved August 10, 2007. ↑ Simon Q. Field, Ingredients — Bleach, Science Toys. Retrieved August 10, 2007. Bodkins, Bailey. 1995. Bleach. Philadelphia, PA: Virginia Printing Press. Trotman, E. R. 1968. Textile Scouring and Bleaching. London: Charles Griffin & Co. This page was last modified on 13 June 2016, at 18:40.